You know that in order to be successful online, you have to have terrific SEO. In 2018, the average company is going to spend 41% of its marketing budget on online search engine optimization. With 61% of marketers saying improving SEO is their top inbound marketing priority, you should be thinking about increasing your online website content efforts. The first step to effectively using SEO and growing your business is identifying who you are selling to. This is what’s called your primary target market, or the people who will make up the bulk of your sales. There are countless ways to reach your primary target market. Here’s how to find your ideal customer and how to connect with them. Startups fail all the time. However, it’s the reasoning behind the failures that gives us the most insight. These all stem from lack of research into your primary target market. Without knowing who your target audience is, you could end up in a market with no need, run out of marketing funds, create a product that nobody cares about, or completely alienate your actual target market. So, it only makes sense to figure out your primary target market. This will help you find the right niche and create the right product. Also, it will save you money by reducing marketing costs. But how exactly do you locate your target market? 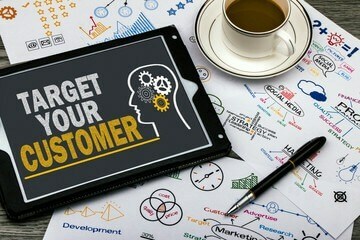 Follow these steps to create a full-bodied persona of your target market. Once you have a visual and knowledge of your ideal customer, your marketing material can be optimized for sales in your niche. Begin by making general groups your primary target market falls into. Factors like age, gender, location, and other broad checkboxes are great places to start. In contrast, you can also use general groups that your target audience is definitely not in. For example, if you have a fitness company that sells supplements, it might be prudent to stay away from older generations who are in nursing homes. Or, if you have a law firm in Tallahassee, marketing in Dallas makes absolutely zero sense. Sometimes your online business caters to men or women, but not both. A specific location or nationwide, but not both. Adults or children, but not both. You can take your company, it’s mission, and it’s products, and roughly see who would be interested. A general sense of your target primary market is a fantastic way to start thinking about who will care about your company and how to market your audience. Yes, you most definitely have competition. The trick is to use what they’re doing and learn from it. If a business in your industry is doing well and is marketing on Facebook to a certain niche, then that might be an avenue worth exploring. On the other hand, if a business is struggling and spending their entire marketing budget on Instagram ads for another group, it’s probably best to avoid this route. Your company and all the other companies are trying to accomplish the same task: Sell the most product to the people who want it most. How you market compared to the rest depends on how wide you scope your business activities, as well as how differentiated your product is. Do you want to be well-known globally or in a small district in Oregon? Do you want to be a cheap version of another company or a cool version that costs a little more? These questions will help you narrow down who’s in the market for your product. While assumptions and competitor analysis can get your halfway there, straight up asking people about your product brings you all the way. User research questions are excellent for determining who would be interested in your company and products. One-on-one interviews, focus groups, or surveys use actual people to test out whether your original groupings and assumptions were correct. It’s also a great tool to segment your market. For instance, if you figured your primary target market is somewhere in the 20-30 male American group, you can dig deeper with people-centric questions. Geographical data, specific demographics, psychographic information, and behavioral tendencies are all useful for niching down your target. Your website is your best friend. Google Analytics can show you who is visiting your site. From there, you can create an image of your main customer. This can simplify your content, refine your products, and improve your website SEO. Looking at which people go to your site (and stay there instead of bouncing off) can give you vital access to your loyal fanbase. When you get the demographic information your website stores for you, you have a clear picture of your most valuable visitors. Now, draw that valuable person! Actually sketching out a persona for your primary target market is a good way to help your marketing team create quality content. With a caricature and a list of descriptive adjectives about your ideal audience member, they can see what works for advertisements and organic content. When you bring on new employees or start a new marketing campaign, you can include this persona with the goal. That way, everybody is on board with who you’re targeting and – more importantly – why. Of course, make sure that with time you review and alter the persona when the company, industry, or target market changes. Time makes your primary target market malleable, so stay on top of current trends and amend when necessary. Your primary target market is the first step to successful SEO and growing your business, no matter if it’s online or offline. Use these tips to identify your ideal client or customer, then go to where they are – social media, other platforms, public places – and market. If you want to upgrade your SEO and be successful with your online business, check out Full Scale SEO’s services.